Part of our new "Limited Edition" Collection! 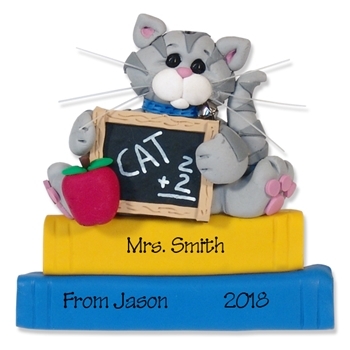 This darling little kitty cat personalized teacher ornament is perfect for any teacher or student. He is so Cute with his little blackboard and apple. This is one of Deb's limited edition ornaments, handmade from polymer clay by Deb herself. It comes complete with a hook and satin ribbon for hanging. May be easily personalized on the blackboard and the white banner to your specifications.